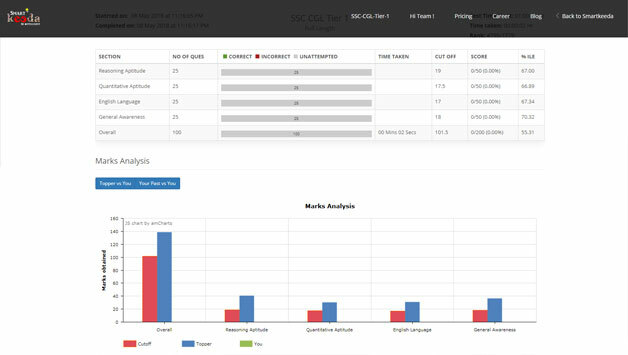 We at Testzone offers full length SSC CGL test series based on new new pattern. Testzone is India’s leading online Test Series platform for all the SSC and Bank exams including SSC CGL Test Series 2019 and under the same we offer free Online Mock Test for SSC CGL Tier 1 Test Series 2019 both in English and Hindi languages. With every single Test Series at Testzone we offer some crucial tools and features that not only help you attempt the right set of questions that can give you a huge boost in achieving important marks but also take you to the final step of success – Your selection in SSC CGL 2019 exam. The SSC CGL 2019 online test series designed by Testzone will surely help you achieve your cherished dreams. Here we are going to discuss the core features of Testzone Test Series which make us different form the rest of the Test Series platforms as far as SSC CGL 2019 Tier 1 exam preparation is concerned. 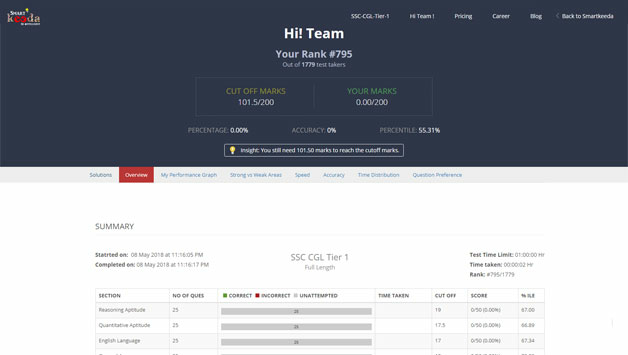 How Testzone is the best Test Series for SSC CGL 2019? If you get stuck to questions which are relatively difficult to solve and tend to lose easy marks by wasting your time on such not so worthy of your attempt questions, Testzone comes for your rescue. 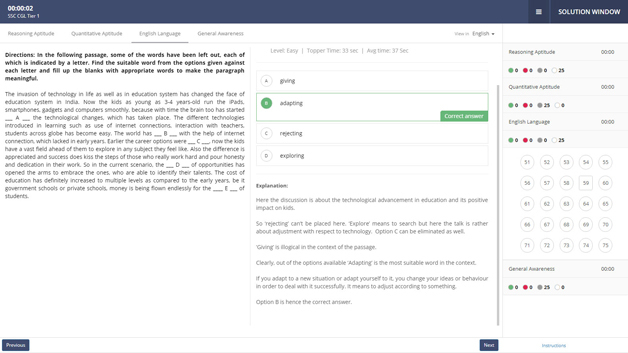 Testzone Test Series Test Interface helps your brain get into practice of skipping such difficult questions by raising an alarm the moment you cross the average user time on a particular question. Moreover, you can evaluate the difference in your scores of two tests – one taken with suggestion mode and the one taken in the real test mode. This will truly let you become aware of your mistakes related to question picking habit and would help you develop a right strategy for the real exam. We take every test seriously and content development for each test goes under high level of scrutiny. Be it questions development or proofreading tasks, we have a team that is best in class. 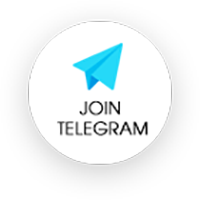 Maximum number of questions in our Test Series are consistently developed by the working professionals already working in different central government departments and they work with us on part-time basis and keep on developing high quality content for us. Besides, we have a dedicated content team in place that also is highly qualified and professional to create quality content every day. We at Testzone strictly follow the pattern of questions being asked in every test series. Besides, keeping the surprises that SSC threw last year, we do offer Surprise Tests among the regular Tests so that you as a user stay prepared for any worst case scenario. 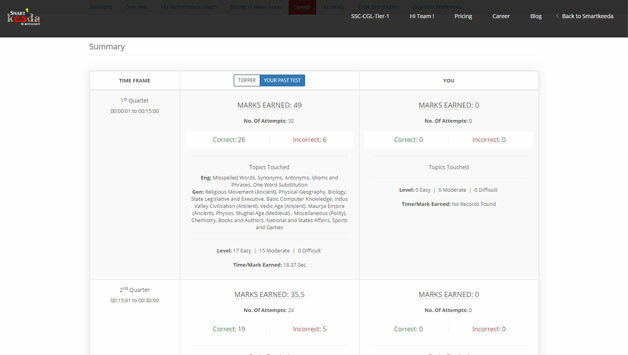 Besides the points mentioned above, we Tier present a number of important After-test Analysis features that make Testzone by Smartkeeda an exceptional Test Series for SSC CGL Tier 1 and SSC CGL Tier 2 Exams. Your percentage marks in comparison to Topper’s as well your past test. Here you can compare your current score with that of the topper and your Tier previous test performance. Now, this is something that is of extreme importance if you are Tier 1paring for any competitive exam. 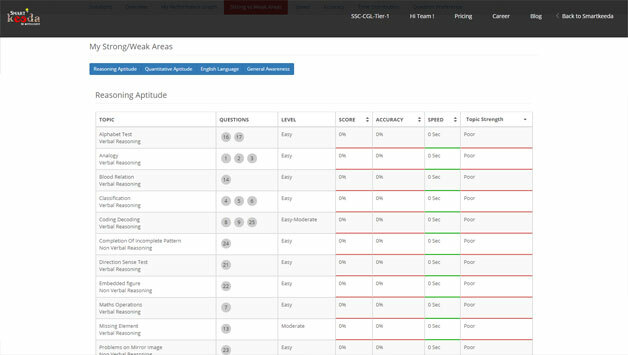 This tool helps you understand your areas of strength and weakness in terms of Marks gained, Accuracy and Speed. It is the most crucial aspect if you are Tier preparing sincerely for SSC CGL exam and Testzone gives you an exact view of your accuracy level. 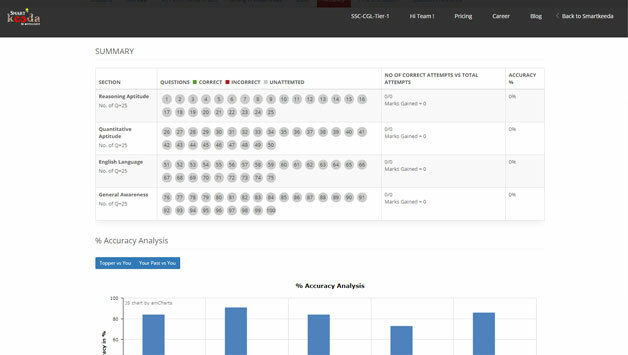 You can even check the level of accuracy over easy, moderate and difficult questions. Moreover, we are soon going to build a stream of new and innovative features that you will find really beneficial for your SSC CGL Tier 1 and SSC CGL Mains exams. So what are you waiting for? Create an account at Testzone now and start taking tests for SSC CGL Tier 1 or SSC CGL Mains exams.